Since the mid-sixteenth century, there has been a tradition in British society wherein, upon the completion of their education, privileged young men would embark upon a celebratory period in which they acquired new knowledge and experience of life. The schoolies week phenomenon can be seen as the contemporary Australian equivalent. This learning experience came to be known, by the eighteenth century, as the grand tour of France, Switzerland, Italy, Germany and the Low Countries. During the nineteenth century, young people from affluent American upbringings were also escorted across continental Europe – to the Old World – to experience according to John Towner, ‘culture, education, and pleasure’. It was also a time in which other life experiences, apart from the knowledge which museums and cultural sites could provide, were encountered as travel abroad provided opportunities for a variety of forbidden fruits: sexual adventure, gambling and drinking. Although the experience of the grand tour was only available to the wealthy, it came to be perceived as a ‘highly conventional activity’: an adventure that signified freedom, culture, history and otherness from the everyday experience of life. Although the practice of the grand tour declined towards the late nineteenth century, the ideological practice of this journey of new experiences left its mark upon the youth of the twentieth and twenty-first centuries. The schoolies week phenomenon can be seen as the contemporary Australian equivalent to the European grand tour. No longer a time for further cultural education and the expansion of knowledge, the completion of secondary school is perceived as an important point of transition, according to Hilary Winchester, ‘a rite of passage from youth to adulthood’ wherein teenagers (both boys and girls) engage in a period of ‘intense physical activity’. The precursor to the schoolies event started in the 1970s, but was largely an underground affair. Since the 1980s, Surfers Paradise on the Gold Coast has developed into the celebratory destination of students from Queensland, New South Wales and Victoria. 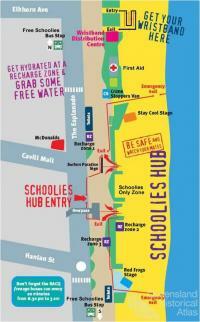 Since the early 1990s, schoolies week celebrations have been appropriated into organised events. They have also diversified to attract the local schoolies crowds up the Queensland coast: Mooloolaba on the Sunshine Coast, Yeppoon and Great Keppel Island in Central Queensland, Airlie Beach in the Whitsundays, Magnetic Island in North Queensland, as well as Byron Bay in New South Wales and Rottnest in Western Australia. Some schoolies also head overseas to places such as Bali, Fiji and Vanuatu. While the Gold Coast event remains the most popular and most notorious of the schoolies week centres, the landscape of these alternative sites is increasingly becoming ideologically linked within the schoolies tradition. For the students it is a week of mayhem. Under the hot Queensland sun they make non-stop noise, perform crazy pranks and consume lakes of alcohol. Their day begins around 10:30 or 11pm. And suddenly they’re choking Cavill Mall, many politely sipping bottles of supposedly soft drink. It’s interesting how much soft drink these schoolies consume and how it affects their speech and ability to walk. They’re turning Surfers Paradise into a school playground. They spit from the high-rise balconies. They drop water bombs and ice-cubes. They yell to each other constantly. At night the streets are full of their seething, raucous crowds. Simultaneously, the landscape of Surfers Paradise during schoolies week is shaped and defined by excessive schoolies week behaviour. 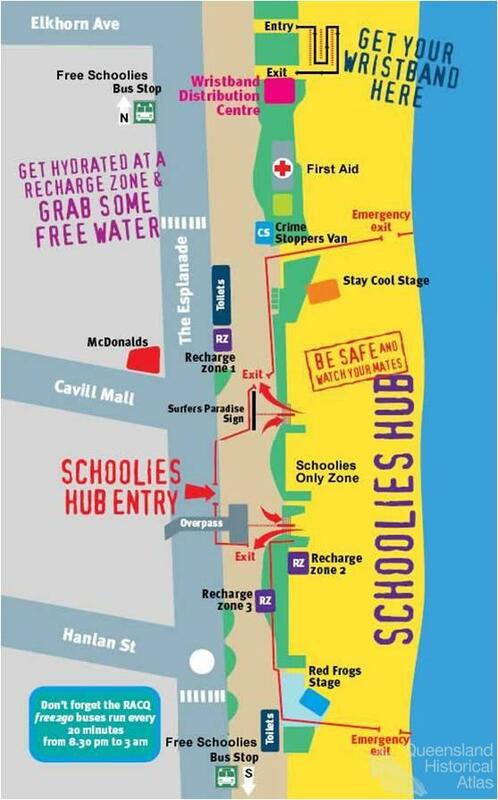 Cavill Mall (simply ‘Cavill’ to schoolies) becomes schoolies territory during the festivities. Alice Jones wrote, ‘We’re going to Cavill Mall – that’s where all the schoolies gather, but not until late’. The landscape of this area is overtaken by a drastic transformation from its usual incarnation. From a thriving shopping mall and nightclub spot, to an overpopulated landscape lined with police and plastic signage that reads ‘Be Safe and Watch Your Mates’, Cavill Mall becomes a unique, thriving and overwhelming streetscape during schoolies week. A dam is bursting here on the Gold Coast. Right now we are at the first rupture, and the currents are very strong. The water jets through the breach. Freed at last from the tremendous pressure, its energy is almost lethal. As school leavers head for the coast for their traditional rite of passage, health workers are warning of a rush of ‘Schoolies babies’ in nine months’ time. Premier Anna Bligh has ruled out scrapping the controversial Schoolies festival despite police branding the class of 2009 the worst behaved yet. The uninhibited behaviour that has come to define the schoolies landscape has also increasingly become a site for moral panic for parents and society in general, a fear that has been heightened by the depiction of schoolies week in the media. Parents provide their schoolies with alcohol so they ‘won’t drink too much’, or become resigned to the fact that schoolies week is a time for uninhibited behaviour. Despite the increasingly strict levels of schoolies supervision and various attempts to prohibit schoolies week, the economic benefits to the region are perceived too great to cease the event altogether. The Gold Coast City Council and schoolies week organisers continue to defend the festival and that for which it stands: pleasure in a landscape that promotes a youthful culture of misrule.